A renowned birding destination has been saved for future generations, becoming the latest addition to the National Reserve System which protects unique Australian environments. The 14,000 hectare station “Bowra” near Cunnamulla, which had been in the McLaren Family for five generations, was offered to the not-for-profit Australian Wildlife Conservancy (AWC) by former owners Julie and Ian McLaren. The property was bought with money from the federal government through Caring for our Country and private donations. Environment Protection Minister Peter Garrett, speaking at celebrations to mark the launch of the new sanctuary, called the bird refuge “one of a kind”. 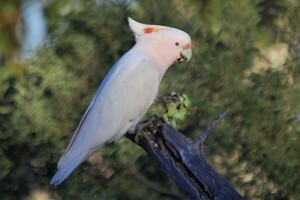 “The diversity of Bowra’s bird life is staggering featuring more than 200 different species, ranging from the pink Major Mitchell’s cockatoo (pictured) to top predators such as the grey falcon,” Mr Garrett said. “Bowra’s woodlands and deep waterholes are alive with rare species, including the vulnerable yakka skink, a range of river turtles and the tiny strip-faced dunnart. “This outback oasis feeds water to the iconic Warrego and Paroo rivers and lies in one of the most poorly conserved bioregions in the country, so protecting it is a big achievement,” the minister said. A vice-president of Birds Queensland, Mr Peter Crow, said the bird club had learnt of the previous owners’ intention to sell about five years ago and approached Australia Bush Heritage and the AWC. “As it has only been lightly grazed and because it has retained a large percentage of the original native Mulga vegetation, it continues to be suitable for a wide variety of native fauna, particularly birds,” he said. “Some of the birds are not widespread in Australia and because of the attractive conditions at Bowra, some species are quite numerous on this property. Some ‘specials’ of the area include Hall’s Babblers which are not hard to find, as well as the ground dwelling Chestnut-breasted Quail-thrush.